Caleb and Jenny Anne Mannan of Bust It Like a Mule. Bust It Like a Mule is definitely a book. Bust It Like a Mule is also — sort of — a band. Bust It Like a Mule is also kind of musical theater. And Bust It Like a Mule is most definitely an experience. How you define this particular book/band/musical probably depends on how you first encounter the world first created by Spokane author and artist Caleb Mannan in 2012, and later fleshed out by songwriters and fellow Busters Jenny Anne Mannan, Kevin Morgan and Jacob Mannan — wife, friend and brother, respectively. Let's begin at the beginning, when Caleb Mannan wrote Bust It Like a Mule, the novel. It's a feverish blaze of a story revolving around one Cotton Kingfisher, an Okie drifter who heads to the sprawling West, kicking up a ruckus in rail towns large and small while seeking a sense of home, "or a rough approximation thereof." It's a story full of fisticuffs and romance and philosophy and music, spread across some of the most beautiful spots on God's green earth, and it's punctuated largely with "bygods!" and "goddamns!" instead of commas and periods. "It's sort of based on my grandpa, who was sort of a poor man's Hank Williams," Mannan says, describing his extended family as Okies who made their way to Oregon before his wing of the clan landed in Colville. "He wrote his own music, he wrote his own poetry, then he would record it. And he would then play it for all of us in the family until we just about went crazy. He played it on his big boombox. "So I knew there was some music in there, in the book itself. It's kind of written in this crazy free form. I thought of it as a poem almost, sort of a big, long free verse. So when I finished, I knew what I was going to do was ask people to write music for it." 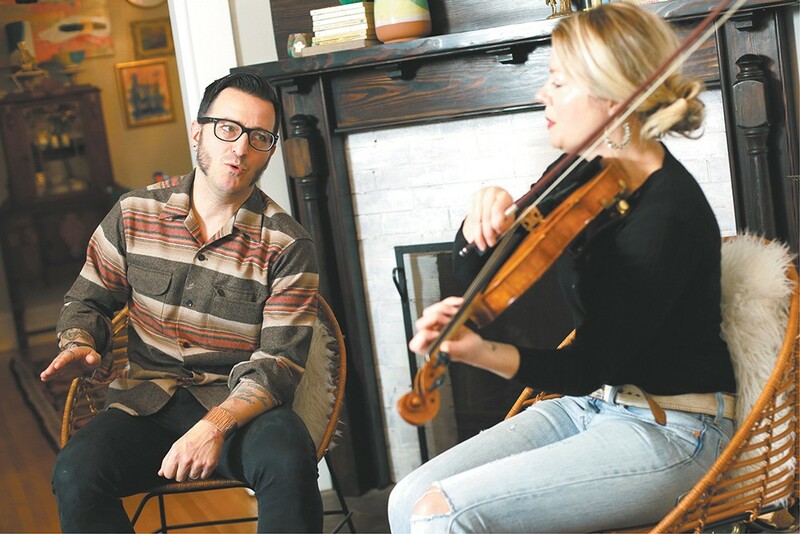 That's where Mannan's wife Jenny Anne — familiar as the brains behind the monthly Northwest of Nashville concert series at the Bartlett, and for her way with a fiddle and microphone — friend Morgan and brother Jacob enter the picture. While Mannan pitched his Bust It Like a Mule book to literary agents, he also sent copies to his trio of family and friends to see what might inspire them, song-wise. "They started sending stuff back and it was way more than I thought it would be," Mannan says. "And it was weird to hear the book back through someone else's eyes. I didn't give them any directions. They came back, and some of them were literal interpretations, some were more thematic, some were more the emotion of what was going on. That was really cool, to see it come to life like that." The punk-folk quartet Bust It Like a Mule. Mannan found himself with a batch of songs and a book that agents expressed interest in — but not enough interest to actually publish it. And again, that's where Mannan's wife Jenny Anne stepped in, self-publishing the tome and pushing Caleb to unleash Bust It Like a Mule on the world. "She's a huge creative partner, and she's basically the music producer on the Bust It shows," Mannan says. "There was always this idea that we'd do a book release, and we called it a hootenanny. We just rented out the Women's Club and we got up there and we weren't really sure what was going to happen. It went over really well, and it started this sort of weird word of mouth." 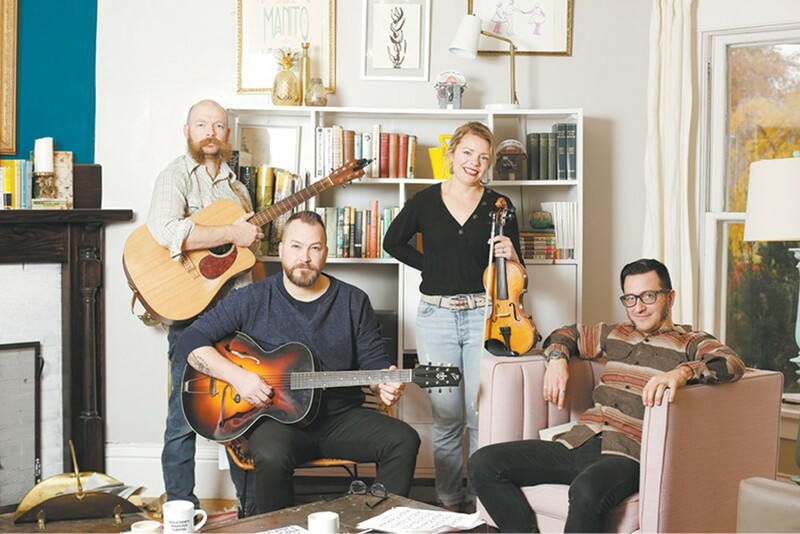 In the ensuing couple years, Mannan and his Bust It musical collaborators only got together to perform a couple times a year, gathering to share songs and stories at places like Auntie's, the Blue Waters Bluegrass Festival or the downtown Spokane Library. That's where I saw Bust It Like a Mule for the first time, about six months ago. And it was a sight. With Morgan, Jacob Mannan and Jenny Anne Mannan sharing vocals on songs, Caleb Mannan essentially became his Cotton Kingfisher character, sharing tales from the book between tunes. The original print version of this article was headlined "Powerful Possession"